Edit: One of the reasons given why a gambling adddiction doesn't fit within the application of Verdins is because, to quote Redlich JA in Grossi, "it will frequently be the case that crimes associated with gambling addiction will have been repeated and extended over a protracted period." In R v Cusack, it was argued that the more spontaneous character of the offending (a robbery to pay gambling debts) could attract the principles of Verdins. The Court of Appeal (Nettle, Redlich and Lasry) unsurprisingly rejected the argument. Not only was the quote above held not to be an essential precondition of the rejection of Verdins principles, it was also found that the offences of Cusack lacked the spontaneous quality argued, but in fact required significant preparation. 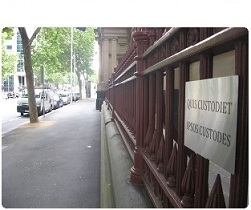 In R v Grossi, the Victorian Court of Appeal decided between two distinct lines of judical authority, dealing with the sentencing of addicts and the mentally ill. Though at first they appear to conflict, the Court decided they don’t. There are lots of cases where gambling addiction was held to offer little or no mitigation for offending. In R v Atalla, R v Telford, R v Molesworth and R v Luong, Ngyuen & Cao the courts said in one way or another that the reduction in moral culpability from pathological addiction to gambling was outweighed by the need for general deterrence. Put in plain-speak: if offenders get lighter penalties for feeding an addiction, other addicts are more likely to yield to temptation and commit similar crimes. Whether this is actually the case or not, Grossi's counsel knew that they were hard against it arguing gambling addiction in mitigation for their client. The sentencing judge rejected the plea for leniency. On appeal they argued though gambling addiction couldn't be mitigatory, underlying depression that caused the gambling addiction and in turn motivated the crime, could be. A mental disorder, abnormality or impairment of mental function can be mitigatory even if it falls short of being a serious mental illness: R v Tsiaris  1 VR 398; R v Verdins (2007) 16 VR 269. If a person was mentally unbalanced at the time they offended, that might affect their moral culpability and hence the appropriate sentence. This type of offender is not considered “an appropriate vehicle for general deterrence”: Tsiaris, citing R v Mooney, unreported, Court of Criminal Appeal, 21 June 1978 per Young CJ. The penalty should also be reduced if the offender will find imprisonment more onerous because of their mental condition. The two lines of authority are difficult to reconcile for those who consider gambling addiction is a mental illness. If gambling addiction is a mental illness, so the thinking goes, why would it be excluded from the application of the principle in Tsiaris and Verdins? Redlich J answered this question in Grossi. Properly analysed, there is in my view no tension between the principle explained in Verdins and those authorities which have dealt with gambling addiction. Evidence may establish that an offender suffers from an impulse control disorder in the form of pathological gambling listed in DSM-IV-TR, the essential feature of which is 'persistent and recurrent maladaptive gambling behaviour that disrupts personal family or vocational pursuits'. The relevance of the disorder to the sentence to be imposed, is then to be assessed in accordance with the principles restated in Verdins. That assessment will generally lead to the conclusion that the presence of a gambling addiction should not, on that ground alone, result in any appreciable moderation of the sentence. There are a number of reasons why that will be so. Finally, and perhaps most importantly, the nexus of the addiction to the crime will often be unsubstantiated. The disorder will not generally be directly connected to the commission of the crime, the addiction providing only a motive and explanation for its commission. Hence, by contrast to a mental condition that impairs an offender’s judgment at the time of the offence, such addiction will generally be viewed as only indirectly responsible for the offending conduct. The Court of Appeal decided Grossi's gambling addiction didn't justify reducing his penalty. Grossi's sentence was adjusted downward slightly, but for reasons that had nothing to do with that ground of his appeal. So even though a person’s mental condition could mitigate their offending, it usually won’t. The seriousness of the offending and tenuous connection between addiction and offence means only rare cases fall in the Tsiaris and Verdins category. Verdins actually dealt with three appeals: Verdins, Buckley and Vo. The reasons why the Court of Appeal dismissed Buckley's appeal are interesting, and are more like the matters routinely heard in the Magistrates' Court, while the facts in Verdins and Vo are a little bizarre. Gambling attracts more stigma than almost any other social disease you can think of. Have a look at sect 271 of the Commonwealth Bankruptcy Act 1966. If you become a bankrupt as the result of gambling you potentially face a criminal offence punishable by one year's jail. No crime if you do the lot on heroin and hookers, only if you lose it on the horses. Only gambling and financial speculation (arguably the same thing) gets treated this way.